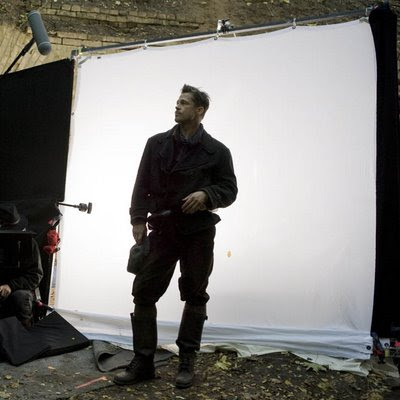 Ain't It Cool News posted the first pic from the movie Inglorious Basterds, (not sure how they are finally going to spell it), showing Brad Pitt in what looks like a promotional pic. I'm really looking forward to the movie, I've purposely avoided a lot of the buzz surrounding the project. I know the script is floating around the net, but I think I'll hold off and not spoil the experience for myself. A part of me worries that Pitt will drop out, he's a strong personality...and Tarantino has had creative differences with people with strong personalities in the past, such as Warren Beatty in Kill Bill and Mickey Rourke in Deathproof. Hopefully it'll all work out. I do hope you won't be offended if I say that I didn't read A SINGLE WORD of your post.